You are here: Home / Domestic Bliss / Rice Krispy Trees! I am not an artsy craftsy person. It’s actually been something that I’ve always wanted to be able to do. But sometimes I get a little bit experimental in the kitchen, and it can be fun. 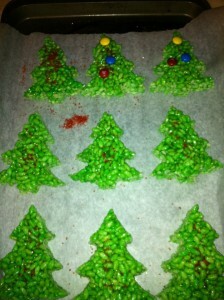 When we made the Rice Krispy Pumpkins for Halloween, I knew that I wanted to make some Rice Krispy trees for Christmas. But sculpting a Christmas tree freehand with sticky warm crispy rice goo didn’t seem like something that I’d be able to pull off. And it gave me these. Pardon the less than amazing photo; I took it with my iPhone last night before putting them away. You know the drill: melt the butter and marshmallows together. The only thing I did differently was I added a splash of vanilla (probably about 1/2 a teaspoon) and mixed in some icing dye. Using green food coloring would work the same way, it’s just that icing dye is a heavily concentrated gel. Once I had the green mixed through and the marshmallows were melted, I stirred in the cereal. I pressed the mixture into a baking pan after spraying my hands with Pam to prevent the mixture sticking to me. I left it to cool, and then cut them out with Christmas tree shaped cookie cutters. I decorated with decorating sugar and M&Ms. Paint with the little tube of colored frosting to add garland, etc. All in all, though, I’m pretty happy with my experiment. They look pretty cool, anyway. And taste delicious. 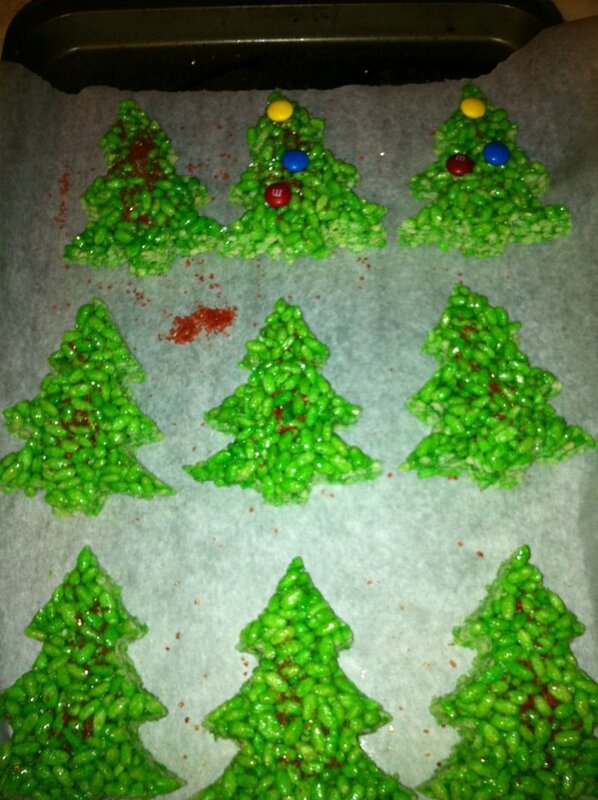 I think they turned out cute and I agree you could never get the color green with food coloring. I would skip the coloring myself (not a fan of coloring). They would look cute white, with white chocolate drizzles and craisins.